De openSUSE software-frontend biedt gebruikers gemakkelijke toegang tot alle software die is gebouwd in de openSUSE Build Service. U kunt gemakkelijk naar software voor uw distributie zoeken. Dit omvat alle openSUSE, SUSE Linux Enterprise en vreemde distributies (Fedora, Mandriva, Debian, Ubuntu). The software portal offers an easy way to select and download your desired openSUSE distribution. 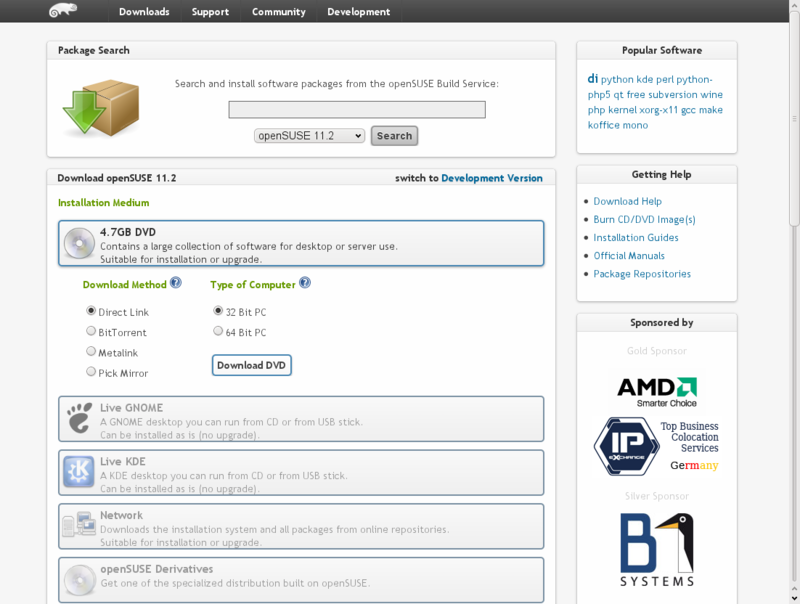 The software portal offers an interface to search for software packaged in the openSUSE Build Service. You can select which distribution you use, to limit the search results to those which are installable on your system. openSUSE users can directly click on the "1-Click Install" Button to install the software with YaST. Users of non-SUSE based distributions should use the link to the general repositories returned by the search results. This searches for the kspaceduel package from the KDE:KDE4:STABLE:Desktop project. Note that the result contains packages for all distributions which are used as target distros. All software that was built by the openSUSE Build Service gets exported to our mirrors and is installable with different package installation tools. For more information, please read the zypper pages. smart upgrade    # Performs an upgrade of all installed packages using the new repositories. YUM can use the repositories after the generated .repo file got copied into the /etc/yum.repos.d/ directory. Afterwards you can use yum commandline tools or GUI tools like kyum. APT isn't very well supported on openSUSE, please check this tutorial for more information. Deze pagina is het laatst bewerkt op 5 okt 2010 om 16:11.